Good deal on that one my dad has that exact upper. Runs flawlessly has had 1,100 rounds through it so far with no hickups. And, i gotta say the whole thing is quite light in my opinion. I just got a melonite barrel from them with thier low profile gas block and tube. Are there any tricks to lining it up with the port in the barrel? I had zero issues lining it up, no trick, just lined it and set it. Have over 1000 through it now. I got the 16" Socom low pro. Ok i installed it the other day but havent had a decent day to shoot it since. I eyeballed it and it lined up perfect because of my X-ray vision. Nice I’m going to see if my xray vision is on par with your xray vision haha. How did the gas block fit? It fit great it cycles very well. I didn’t even need to move it. 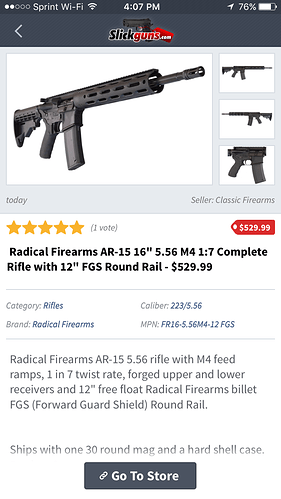 This is the company my nephew ordered his AR. No issues and shoots perfect. He’s very happy with it.